This is a great selection of ornaments from Oregon, for Christmas or for any time of the year. Have you ever been to Oregon? It's one of the most beautiful and interesting states in the country. It is still very much wide open, with not too many crowds, except in Portland, its largest city. Not far outside of Portland, the city gives way to nature. There are rivers, mountains, fields and waterfalls, including the widely photographed Multanomah Falls with multiple cascades. When I was growing up, Oregon is where we vacationed, traveling from our California home to visit family. Although the state seems more developed and congested, with traffic jams if you try to navigate Portland by car anywhere near rush hour, it's still one of the loveliest states in the lower 48. So, if you've visited Portland, or happen to live there, here are some beautiful ornaments you might like to own or give as presents. Each of them is made by Zazzle, an online gift store that sells unique artistic creations on commission. That means you won't find any of these pieces in regular brick-and-mortar stores. The round ornaments without borders, shown below, can also be customized to say anything you want, such as "Merry Christmas" or "Had a Great Vacation" or "Love you Mom and Dad." The famous White Stag sign is seen from many parts of Portland, and is very noticeable as you cross one of the bridges spanning the Willamette River, which cuts through the city. This is a landmark that once displayed the words "White Stag" instead of the present "Portland Oregon." That's because the city acquired this sign in 2010, as the White Stag Sportwear line of casual clothing was acquired by Walmart in 2003. The company got its start in Portland, where it began selling ski suits in the 1930's, as the sport gained popularity in Oregon. It then branched out and began to manufacture women's casual wear. The White Stag sign, also now known as the "Portland Oregon sign" has the distinction of being a City of Portland Historic Landmark. The ornament shown below also comes in different versions, such as an oval, star and t-shirt-shape. Cannon Beach, Oregon is a famous resort on the Oregon Coast, a two-hour drive from the center of Portland, allowing for the inevitable traffic. As you take US-26 West, you pass through some beautiful scenery, including a temperate rain forest. The little town of Cannon Beach is perhaps most famous for Haystack Rock, which juts out of the edge of the ocean, as you can see in the ornament below. It stands 72-feet tall, and you can walk to this rock at low tide. The two smaller rocks on either side of Haystack are known as the "Needles." One of the loveliest spots in Portland is the International Rose Test Garden, which contains upwards of 10,000 rose bushes. This garden is located on a hilly spot of Portland, overlooking the city center. From one spot, if the sky is clear, you can see Mount Hood in the distance. Mount Hood is a volcanic mountain that's part of the Cascade Range that runs throughout the Pacific Northwest, from British Columbia to Northern California. This peak of this mountain, at 11,249 feet, is the highest elevation in Oregon. The ornament below is a view of Mount Hood from the Rose Garden, surrounded by a border of roses. 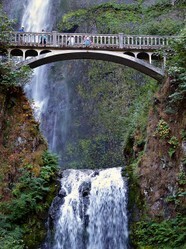 Multnomah Falls is a must-see if you travel to Portland. This waterfall is located less than an hour outside the city in the Columbia River Gorge National Scenic Area. It sits in the State of Oregon, just south of the Washington State border. The upper portion of the falls has a drop of 542 feet and the lower portion of the falls is 69 feet. Although there are many waterfalls within the Cascade Range, this is the tallest waterfall in Oregon. Hi WriterArtist, you'd love Oregon but I'll warn you that Portland is a little different. But it's a very beautiful city and the people are lovely. The way you describe Oregon, I am tempted to visit the place. Rivers, mountains, jungles are my weakness. Love these nature inspired ornaments. For those who celebrate the Christmas season in a warm climate, the tree skirt usually includes seashells and nautical items. Gumdrop Christmas trees are a great alternative to a traditional tree, ideal for small spaces, and can be a Christmas memory your children will cherish for years to come.